Mild to moderate earwax buildup is common in children of all ages. Though you can wipe the external ear clean with a washcloth, the website Ask Dr. Sears recommends that you leave any wax inside the ear canal alone. Inserting a tool or cotton swab into your baby's ear can push the earwax even deeper into the ear, which can cause an infection. Cleaning inside the ear can also puncture the baby's eardrum. If you're concerned about excess earwax buildup, Ask Dr. Sears says that you can try hydrogen peroxide drops, but you must first consult with baby's pediatrician. Wet down a soft washcloth with warm water and use it to clean the earwax that's collected around the baby's outer ear. Do not push the washcloth into the baby's ear. Most of the time, any wax that's visible will fall out on its own. Visit your pediatrician to see if he has any suggestions for clearing out the wax inside your baby's ears. He may use a tiny scoop to scrape them out or prescribe ear drops if he deems them necessary. Fill a small, clean glass bottle halfway with hydrogen peroxide. Fill the bottle the rest of the way with water and shake to combine. If you want to try clearing your baby's ears with a hydrogen peroxide solution, be sure to get the doctor's approval first. Choose a time of day when your baby is calm to administer the eardrops. Warm the glass bottle between your hands and lay the baby on your lap so that her blocked ear is pointing up. Fill an eyedropper with the solution and drop the mixture, one drop at a time, into the baby's ear canal until it is full. Wait five minutes, or as long as the baby will lie still, before letting the child sit up. The drops will soften the wax and help it run out of the inner ear. Wipe around the baby's ear with a damp washcloth to clean up the drops and wax. Repeat the treatment once daily for three to five days. Then, while the baby is in the bath, use a rubber ear bulb to squirt lukewarm water into the baby's clogged ear. Wax should flow from his ear in large chunks. Never use hydrogen peroxide ear drops on a child who can't support her own head. The drops and water will not drain properly. 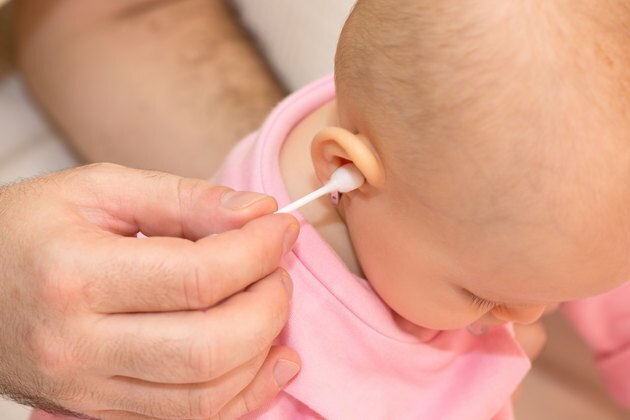 Baby Center: Can I Clean My Baby's Ears With a Cotton Swab?